Fueled by a flourishing capitalist economy, undergirded by advancements in architectural design and urban infrastructure, and patronized by growing bourgeois and elite classes, New York’s built environment was dramatically transformed in the 1870s and 1880s. This book argues that this constituted the formative period of New York’s modernization and cosmopolitanism—the product of a vital self-consciousness and a deliberate intent on the part of its elite citizenry to create a world-class cultural metropolis reflecting the city’s economic and political preeminence. 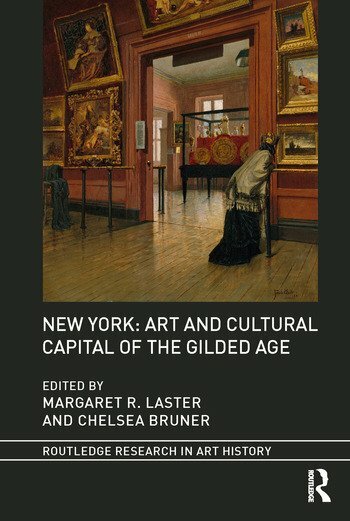 The interdisciplinary essays in this book examine New York’s late nineteenth-century evolution not simply as a question of its physical layout but also in terms of its radically new social composition, comprising the individuals, institutions, and organizations that played determining roles in the city’s cultural ascendancy. 9. Before the Farragut: Who Was Augustus Saint-Gaudens? Margaret R. Laster is an independent curator and scholar of American art. Previous posts include Associate Curator of American Art at the New-York Historical Society, and Lunder Consortium for Whistler Studies Fellow at the Freer Gallery of Art. Her research centers on art and material culture of the nineteenth century, including Gilded Age collecting and patronage histories. Chelsea Bruner is a member of the liberal arts faculty at Ringling College of Art and Design in Sarasota, Florida, where she teaches Design History. Her work centers on architecture and interiors of the nineteenth and twentieth century, with an emphasis on elite patronage and the professionalization of architectural design in the Gilded Age.